Flying out of the UK? Make sure you’re up to date with the latest on electronic devices and new laptop ban security rules at Gatwick Airport and other UK airports. Here’s the must-have information to ensure you don’t miss your flight – or have expensive phones, tablets or other devices confiscated. By its nature, airport security can be secretive with fast-moving changes as authorities react to ever-changing needs of other countries and international issues. Here’s the information you’ll need to negotiate Gatwick Airport security – and not risk losing your electronic devices. Britain is following the US by blocking passengers from carrying tablets, DVD players and phones over a certain size on flights heading to the UK from selected airports in Middle Eastern countries. Here’s all you need to know about the ban; how it works and where it applies. What are the new rules affecting travelling with electronic devices? The Government introduced new aviation rules on March 21, which banned selected electronic devices from being carried in the cabin on flights to the UK from six countries in the Middle East and North Africa. The new restrictions relate to security concerns on flights originating from these countries. The move follows a similar ban introduced by the US authorities. The ban includes large phones, all laptops, all tablets and e-readers such as Kindles. What countries are covered by the ban laptops and tablets in the cabin? UPDATE JULY 28, 2017: Passengers flying from Ataturk and Izmir airports in Turkey will now be allowed to carry electronic devices – such as laptops -in the cabin. However, this only applies to passengers flying with Turkish Airlines or Pegasus. All other Turkish airports are still covered by the ban. The Government’s new rules mean that large electronic devices will be banned from being carried in the cabin from the following countries. 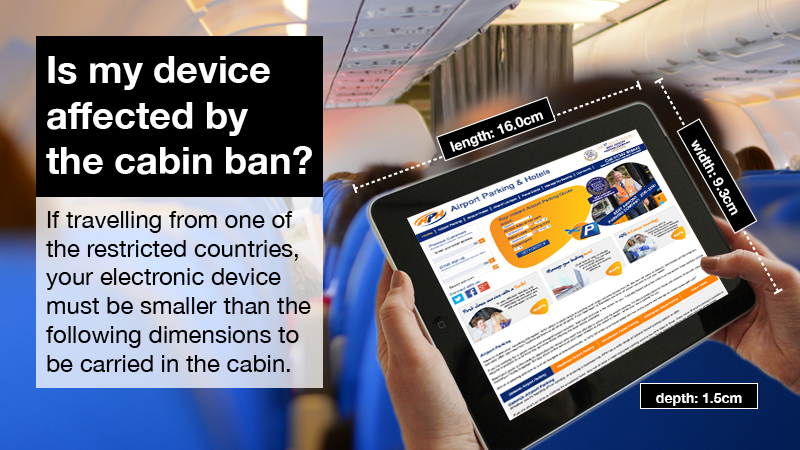 What electronic devices are affected by the cabin ban? The UK cabin ban on large electronic devices from some Middle Eastern and North African countries include the following – which will all need to be packed in hold luggage. What is the maximum size of a an electronic device that can be carried in the cabin from the affected countries? Where do I pack spare batteries and portable power chargers? If travelling from the six restricted countries named above, you will NOT be able to carry spare batteries or portable power sources either in HOLD or CABIN luggage. Can I take my phone in the cabin? Standard-sized smartphones will be fine in the cabin, along with most larger devices. 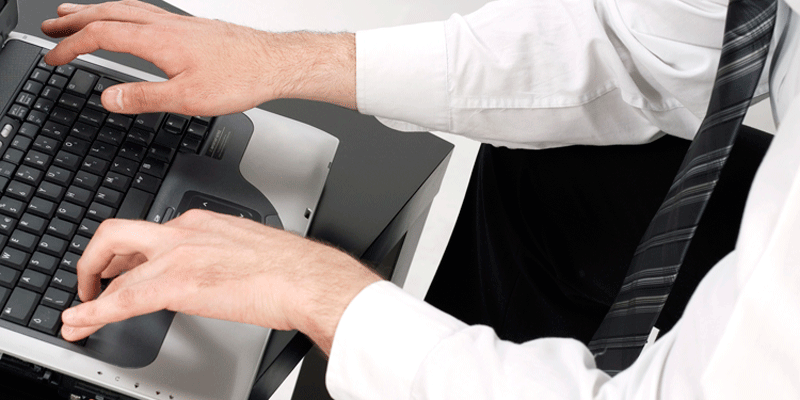 Will packing my laptop or tablet in the hold mean it is not insured? It has also been reported by ABTA that devices placed in the hold are not typically covered by travel insurance. Make sure you read the small print of your travel insurance before you travel to ensure you’re covered. Some policies only cover electronic goods for less than they are likely to be worth. Double-check the figures. Does the cabin laptop ban apply to flights from the UK to the six named countries? No. The UK has some of the most robust aviation security systems and measures in the world, so it is not believed to be “necessary” to extend the ban to outbound flight to the six named countries. Will my essential medical equipment be banned from the cabin? As long as it is essential, medical equipment can be carried in the cabin on flights from the six restricted countries. The equipment will be screened and you will need a letter from your doctor or medical professional confirming you need the device at hand during the flight. Here is a quick guide to medical equipment and where it can be carried on all flights. What about a new tablet I’ve bought in duty free? Don’t! You will not be able to carry it in the cabin on your trip back to the UK. Is the US ban on incoming flights the same as the UK’s restrictions? The US ban prevents devices such as cameras, DVD players, laptops and games being carried in the cabin – whereas cameras are not banned by the UK’s restrictions. What originating airports have restrictions for those flying into the US? It does not apply to American-operated carriers. The new rules took effect at 3 a.m. E.D.T. on Tuesday, and must be followed within 96 hours by airlines flying to the United States from the above airports. Officials in the US have revealed passengers will not be able to take the Samsung Galaxy Note 7 on flights or in their luggage to and from the US from 16:00 GMT on Saturday, October 15. The ban applies to all flights and not just US-based airlines. The announcement was made by the The US Department of Transportation. Anyone flying from Gatwick Airport or all other UK airports is expected to be able to show that electronic devices in their hand luggage can be switched on. This doesn’t just apply to US-bound flights, either – passengers could be asked to power-up devices on any route. Interesting question. Many airlines are stating on their websites that they have charging facilities at the gate where passengers can charge devices if they have time. When we contacted the DfT, a spokesman told us this information was not available for security reasons. The spokesman’s advice was to make sure all your devices are charged while at the airport. However, most statements from airlines suggest that it is ‘at the gate’ where you’ll need to prove the device is operational. This is important because it opens up more ‘charging’ locations. No – official guidance states that you must be able to switch on devices when ‘flying to and from the UK’. Phones, tablets and laptops will certainly be on the list, but also devices such as MP3 players, camera equipment, electric shavers, along with hair dryers and straighteners. These are all devices that you’re allowed to carry in hand luggage. It’s not clear and the Department for Transport has not elaborated on this. However, most devices with rechargeable batteries – such as phones, laptops and some chargers – are banned from hold luggage, so it’s best to ensure all devices can be switched on. Once again, the DfT is not giving away detailed information apart from confirming the restrictions will apply to flights to and from the United States. However, the underlying advice is that all international passengers should be in a position to comply with requests to turn on devices. UK travel organisation ABTA says the DfT has advised it that the new measures will affect ‘some routes into and out of the UK’ but it’s not saying which. Here’s how a selection of popular airlines plan to address the problem of passengers with uncharged or broken devices. British Airways: BA originally said that out-of-charge passengers would have to reschedule their flight but later updated this by stating they could choose to fly and have the device posted to an address of their choice. The airline will foot the bill. Virgin Atlantic: Like British Airways, Virgin Atlantic has offered to pay for the broken or uncharged device to be posted to an address of the passenger’s choice. Thomas Cook: The airline says that passengers would be allowed to join the flight from Gatwick Airport if they left their drained device behind, or arranged to have it forwarded on – presumably at their own cost. Monarch and Thomson Holidays: No comment has been issued. Anyone who can’t turn on a device when asked could be barred from the flight, or more likely have the device confiscated. If your phone or other device is out of charge, there are options at Gatwick Airport. Read our full report later in this article. Can I take my portable phone charger (power pack) on a plane? Can I pack any portable chargers in my hold luggage: The Gatwick Airport website states that ‘Lithium batteries should be carried in your hand luggage only’, so those with ‘alternative chargers’ may be tempted to pack power packs that use solar or wind-up power in the hold. However, while these devices are charge by the likes of sun and kinetic power, most still house Lithium batteries to store the power. Pop them in your hand luggage and make sure they have power. Where to carry your device, packing spare batteries and can you use it on the plane… all covered here. Can I use my e-cigarette on the plane: The question of comparing e-cigarettes with regular tobacco products is contentious, with many commercial establishments allowing the devices to be used in an attempt to to beat the smoking bans. This is not the case on planes. It’s very clear – you are not allowed to ‘vape’ on planes. Where do I need to pack my e-cigarette or similar device: Anyone travelling with e-cigarettes, e-cigars, personal vaporizers and electronic nicotine delivery systems must pack the device in their hand luggage. This is because these devices often contain lithium batteries, which are not allowed in a plane’s hold – so must not be in your ‘checked’ luggage. Can I recharge my e-cigarette or similar device when on the plane: No. You are not permitted to recharge your ‘vaping’ device while in the aircraft. This is to avoid the risk of them overheating and causing a fire risk. Can I pack spare batteries for my e-cigarette system: Any spare batteries must be individually protected by the original unopened packaging, by insulating terminals with tape or packing each battery in a separate pouch / plastic bag. Passengers can take no more than two individually protected spare batteries. So it is okay to carry all rechargeable batteries in the plane: It’s fine to carry rechargeable batteries that have a Watt hour (Wh) rating of not more than 100Wh – the new iPhone and Samsung Galaxy S7 are rated around 11Wh to put this in context. However, the batteries must not be packed in checked luggage. If your power packs fall outside of this range, you should contact airline to seek further advice. Getting yourself a portable power pack is a great way to ensure you’ve always got juice in your phone. However, many power packs require charging themselves – meaning they might not have power to top up your device and then get confiscated themselves. Here are some alternative charging devices that should be ready to go at all times. While all electrical devices need to be charged, it’s likely to be smartphones that will cause most angst for travellers. So, if your power bar’s heading south at an alarming rate, here are our tips for conserving your battery power. 1: Ensure you close all apps running in the background. Despite not being in use, they’ll constantly check for updates and zap your power. 2: Turn off Wi-Fi, mobile data roaming and Bluetooth. These will continually search for connections and soak up even more power. 3: Turn off GPS. While you might not be able to locate your exact position, looking out of a window and spotting a large jet parked outside should help confirm you’re at the airport. Shutting down your GPS will save plenty of battery power. 4: Disable vibrate: It might be a great way to let you know when your phone’s ringing while it’s set to silent – but it will also take liberties with your battery. Turn it off now. 5: Dim the screen. Doing this will help reduce the amount of power needed to light your screen – giving you even more minutes of battery life. Don’t forget to disable ‘haptic’ feedback, too. This is the slight buzz when you tap the screen while writing texts, etc. 6: Enable airplane mode. Going under the radar for an hour or two at the airport will be a small price to pay for not having your phone confiscated at the gate. Airplane mode will ensure all battery power-munching connections are cut. Chargebox kiosks at Gatwick Airport: Gatwick Airport offers ChargeBox kiosks where you can boost your smartphone’s battery as you wait to fly. The service consists of a secure locker equipped with charging leads and adaptors for most popular handsets. You can charge your device for between 30 and 90 minutes. The lockers have a unique key for added security and are located in the departures lounge of North & South terminal – meaing you can leave them charging as you head off and get a meal or do some shopping. Using the service costs from £1.50 for 30 minutes. Speak to your airline: Several airlines are offering charging facilities at the gate. Both British Airways and Virgin Atlantic have said they will offer limited facilities – including adaptors – for its customers at the gate. Make sure you get there early. Gatwick lounges: Charge your device in luxury, as you join the jest set and dodge the crowds ini one of Gatwick Airport’s exclusive lounges. You can enter them up to three hours before you fly, so there should be plenty of time to get a good charge in your device. Make sure you have your own leads and adaptors. Enjoy free drinks and snacks in these exclusive lounges from £16.00. Anyone flying from Gatwick could be asked to undertake a full body scan. Being selected can be a daunting experience, so here’s all the information you need to make sure you’re fully aware of what the machine does and if you can refuse the request to be ‘scanned’. Yes, according to Government research. Tests have concluded that the scanner is less invasive than a mobile phone or than being in the sun. It is also certified as safe for pregnant women, children and those with medical implants such as pacemakers. No. Passengers will go through the usual metal detector gates, but some will be picked out at random to be tested in the scanner. The exact reasons why someone gets chosen are kept secret for security reasons, but selection cannot be based on on ethnicity, origin, gender or destination of travel. If chosen, you will be asked to stand in the machine and assume a particular position. There might also be a request to rotate to a second position. The scan will take just a few minutes. No, not in any image that’ll be seen by a human. The scanner uses an Automatic Threat Recognition and Detection functionality to digitally look for possible threats. If any are detected, the scanner will display them on a ‘gingerbread man’ image for the human operator to review. He will then decide if a physical search is needed. The image is analysed from within the computer and will never be seen, transmitted, saved or printed. No. Children might also be asked to go through the body scanner. The Government’s Code of Conduct covering body scanners states: ‘An individual may opt out of being scanned. In this instance, the individual must either be screened by an alternative method which includes at least an enhanced hand search in private or that individual must not be permitted to enter the security restricted area, or, if applicable, he or she must be removed from it. An enhanced hand search in private must take place in a private room or an area away from the main search comb. This may involve the loosening or removal of clothing. on flights from Newark liberty to Heathrow and back, can we bring IPads, iPhones, Kindles, extra charger in hand luggage? My daughter & I flew back from Amman, Jordan on a BA flight into LHR on 20/4, we had power packs in our hand luggage and we were informed they were too big. We asked if they could be put in our checked in luggage along with our IPads & kindles, we were told no and they were sunsequently confiscated. These were expensive items so please be aware. Stella, I had the same flying through Istanbul today. It appears that information regarding this isn’t being disseminated to passengers as there was a massive pile of expensive power packs at the gate desk. Despicable that the airline refuses to reimburse you for these considering that they have clearly failed to inform. we had chargers that were exactly 1.5 cm wide – and according to information this is on the allowed width. However, they used a measuring device that was clearly a lot less than this and they were subsequently confiscated. Don’t take any batteries on board as the width is the size of an envelope measurer at the post office for large mail! I don’t know of any power banks that will fit through. They nearly tried to take an iphone 7 off us as they said it was too wide with case on! When the airline said they were too big, did this refer to the physical size or the power rating? The problem is at the Ataturk or/and Sabiha Gokcen airport. The electrical devices such as power bank is banded by UK Government. Hi I’m flying to Tenerife on Monday (29th August) and my phone screen is smashed and wont turn on, the lights next to the button at the bottom turn on but the screen doesn’t, will I get my phone confiscated or can it be put in my suitcase? (I am planning on getting it fixed in Tenerife). Also I am taking my Tablet with me but the charger doesn’t charge it anymore (planning on buying a new one in Tenerife) does the same thing apply? They will confiscate items that do not conform to requirements – believe me they are getting hotter on mistakes or deliberate attempts to avoid the rules! I am taking out a boxed brand new top set box in my hold luggage . do I have to inform the airline of this ? I have titanium in my body what will happen if that shows up on the body scanner? Hi – You should be fine, but taking a letter from your doctor will ensure you have no problems. Staff will deal with situations like this all the time. Can I take my Nokia charging box in my hand luggage? It doesn’t show when it’s turned on (apart from when it’s plugged into my phone and my phone says it’s charging) will it be confiscated? Hey I was wondering, can a hair straightener goes in?